(1nov06) This issue will rerun the capsize essay, first part. The 15 November issue will continue the topic. Wojtek H. take Wojtek B's new Robote for a spin on the Vistula river near Warsaw. For a number of years I have owned various "shallow water cruisers" (to include a Sea Pearl, a Dovekie, and a Marsh Hen). These are trailerable boats with shallow draft and minimal accommodations (involving some sort of tent). Shallow water cruisers make good day sailors and are often towed to distant locations for a rendezvous with similar boars and a weekend cruise. 1. I needed a comfortable place to sit. 2. I needed to move around the boat without ducking or crawling. 3. I needed a boat which could be set up or taken down with little effort. 4. I needed a boat with the ability to reduce sail drastically while maintaining a balanced helm. 5. I needed some sort of cabin which was long enough to lie down in. I have a large collection of boat plans and the internet offers many more plans, but nothing seemed to provide all of the features which I wanted. 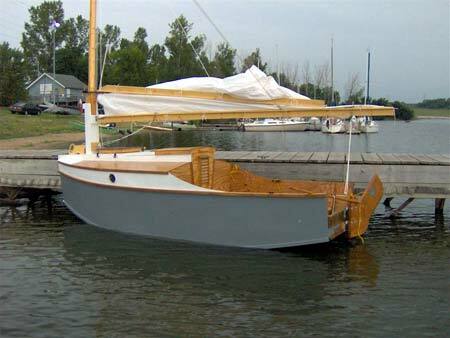 Jim Michalak�s Toon 2 design had some potential, but at 15 feet in length, its cabin is too short for me to lie down in. I commissioned Jim to modify Toon 2. 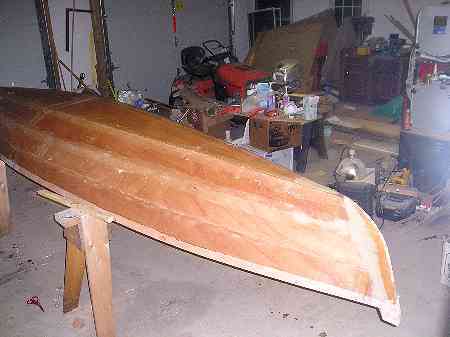 First, he lengthened the boat from 15 to 19 feet in length while keeping the same beam and depth. 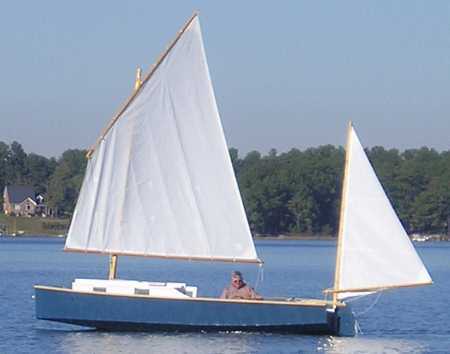 Second, we came up with a cat-yawl* rig using a balanced lug main and a sprit boomed leg of mutton mizzen. Jim was good enough to respond to my needs and kind enough to gently steer me away from my sillier ideas. He drew the plans and I built the boat. As always, it took longer than I expected and isn�t finished as well as I might wish. Here is what I got. Toon 19 may be considered to be a sharpie with the chines cut off and replaced by "bilge panels". This hull form is a plywood incarnation of the round chined "non pariel" sharpies and is supposed to reduce eddying around the chines. It is easy enough to build in stitch and glue and has the advantage of a flat bottom for beaching. The cockpit does, in fact, provide comfortable seating. The seats are 12 3/8 inches above the floor and there is a nicely raked seat back formed by the sides of the boat. The space under the seat support is open so I can stretch my legs. However, the opposite seat is close enough so I can either put my feet up or brace myself as the boat heels. It is amazing that very few boats offer comfortable seating and delightful to have one that does. Toon 19 has a full length companionway in its cabin. I can stand up between the seats and walk to the front of the cabin. Tending anchor, setting and lowering sail, and reefing are done while standing hip deep in the cabin. The layout of the boat keeps me in the center while moving around and minimizes the chances of going overboard. 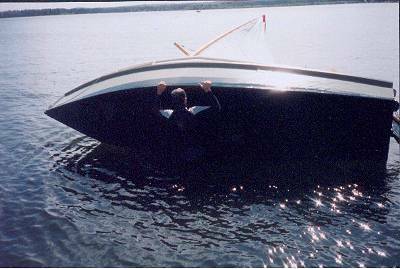 The rig of the boat requires short, light spars. I simply pick the mizzen mast up (complete with sail and sprit) and drop it in its step. The main mast drops into its step in the floor of the cabin and is easily raised to its upper step on the side of the "slot top". The ergonomics of this layout is such that it takes very little strength to step or drop the mast. I can pull up to the launch ramp and have the boat rigged in 10 minutes. It takes about 15 minutes to furl the sails and drop the masts. Years ago the Windmill club had t-shirts that said "I�d rather hike than heel". In my later years, I would rather reef than hike. Reducing sail can change a white knuckle sail into a relaxed sail. 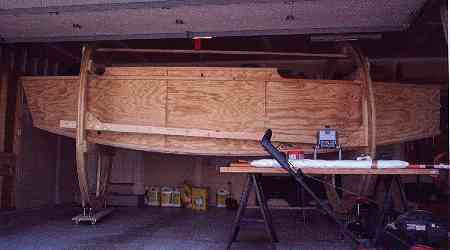 However, the center of effort on some sail plans moves foreward as the sail is reefed. This can produce a lee helm which is the last thing I want when the wind kicks up. 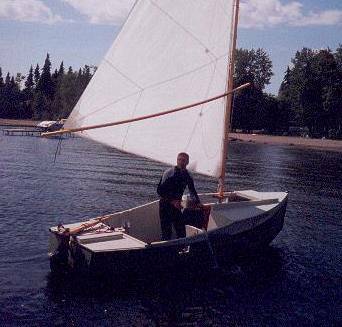 Quadrilateral sails aren�t too bad in this respect, but a little mizzen allows the skipper to dial in weather helm by adjusting sail trim. With the main dropped and the mizzen sheeted amidship, the mizzen will hold the boat more or less head to wind. At anchor, the mizzen keeps the boat from walking around the anchor. Toon 19�s cat-yawl rig actually does all the things described above, and with two reefs in the main will have all the flexibility I will ever need. However, I coerced Jim into drawing a "storm jib" to be flown in place of the main. An English kit boat company (see Error! Bookmark not defined.) came up with the idea and on paper, it should work in "survival conditions". I have the sail, but I haven�t had occasion to use it yet. It will be interesting to see how it works, but since I try to avoid sailing in "survival conditions" I may never know if it is as good as I think it is! 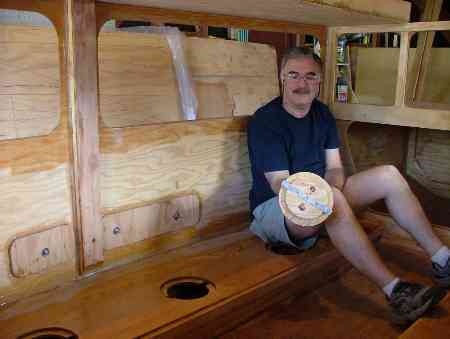 Toon 19�s cabin has about 28 inches of headroom. It is long enough for me to lie down in and deep enough to use a porta-potty in decency if not in privacy (the user�s head and shoulders tick up through the slot top) The cabin is suitable for one sleeper. The bilge panels cut into flat floor space. If you need to sleep two, a flat bottomed boat would be a better choice. A fabric cover makes the cabin more or less watertight, and the four deadlights make for a bright cabin. Due to the low headroom the cabin would not be a good place to sit out a rainy day, but for her intended use as a week-end cruiser, this is not a drawback. So how does Toon 19 sail? I�m still working out details and I haven�t had a chance to sail in company with comparable boat, but so far I�m pleased. 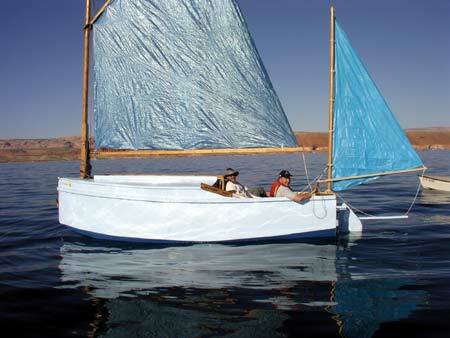 The boat is well balanced and responsive to rudder and sail trim in light and moderate wind. She heels a little more quickly than I might like (perhaps a little ballast would slow the roll), but exhibits good reserve stability. 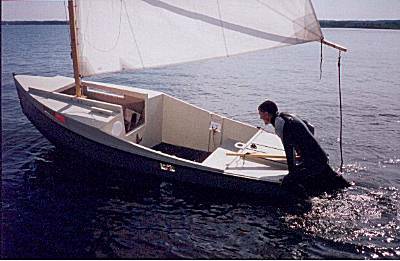 With a single leeboard, the main offset to port, a balanced lug sail which hits the mast on one tack, and the mizzen offset to starboard, Toon 19 is an extreme example of asymmetry. I have tried to determine if the boat has a favored tack; if so, I haven�t been able to identify it. I can point to 45* of the wind but I generally sail freer � somewhere around 50* -- and the boat is much happier and faster. Off the wind, the balanced lug acts a lot like a square rigged sail. Jibes are very gentle, in part because the portion of the sail forward of the mast acts to slow the jibe. Incidentally, if you want to make a balanced lug sail upwind, you need to keep the leading edge tight. This is accomplished with a tackle or a downhaul. I happened to have an old Harken Magic Box from a wrecked Windmill. It is certainly overkill, but it keeps the leading edge tight. 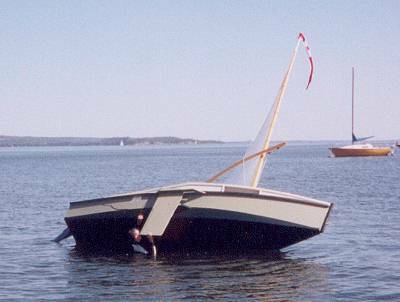 In the past 40 year I�ve built 11 boats and I�ve concluded that there are only two valid reasons to build a boat. First, I enjoy the process (and this is justification enough). 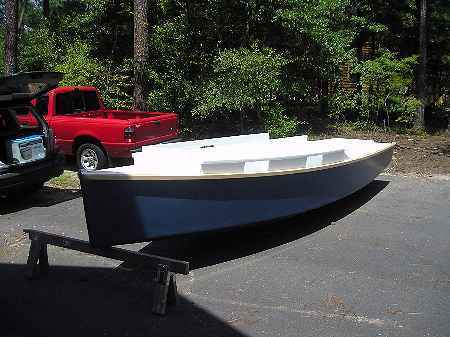 Second, building a boat can be the only way to get the boat you want. Building a boat was the only way to get all the features I wanted. Toon 19 is that boat and she should meet my needs for sometime to come. Or until the boatbuilding bug strikes again." Toon19 is taped seam plywood. Looks like nine sheets of 3/8" plywood and two and a half sheets of 5/8" ply. Plans for toon19 are $40. 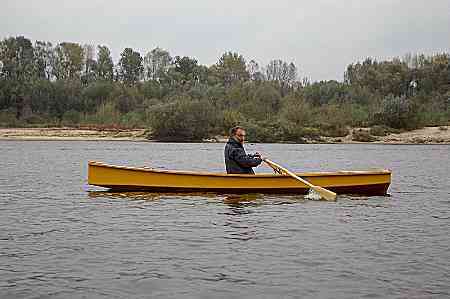 And here we have an LHF17 rowingboat. 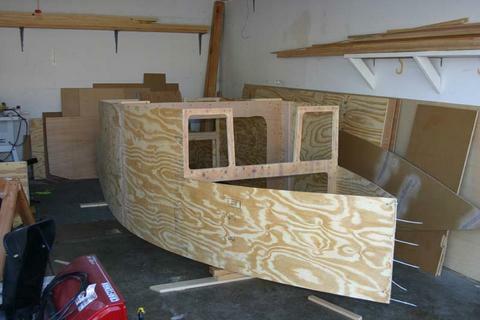 The boat is being assembled now and the builder reports it to be at the limit of the taped seam method because of the wicked twist in the garboard. That would be true with any building method but perhaps the real Herreshoff builders used steamed planks. The builder also doesn't like the method of blending the ends of the planks into the stems (I copied from Bolger) using putty and tape saying he would prefer traditional rabated joint. Not a project for the first timer!